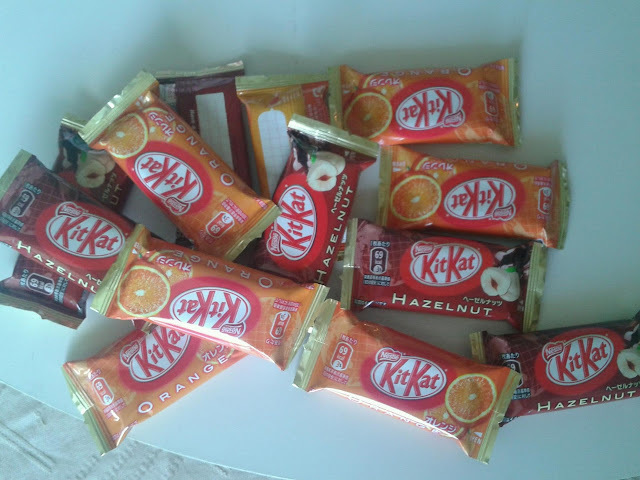 Inside each bag comes with 7 pieces of the orange kit kat and then 6 pieces of the hazelnut kit kats. As you can see, they're individually wrapped even with space available on the back to write something to someone, if you wanted. They are the mini size of kit kats and are both covered with a milk chocolate instead of a colored chocolate like some of the other Japanese kit kats. 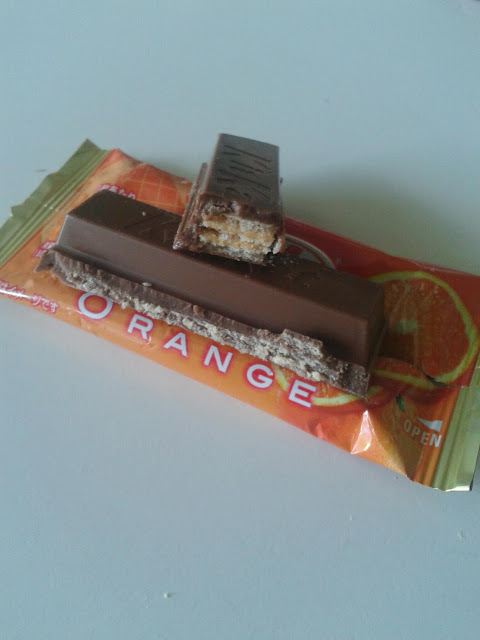 Below is the orange kit kat. 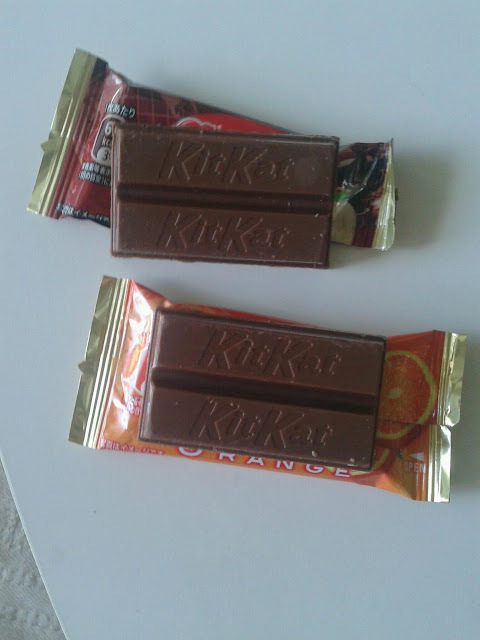 As you can see (hopefully), the orange flavors comes in between the layers of wafer from the kit kat that has a nice tart orange choco/cream inside. I'd have to say the orange was very tasty and reminded me of those Terry orange flavored chocolate balls, but with a stronger and truer orange flavor. I liked this better than the hazelnut. 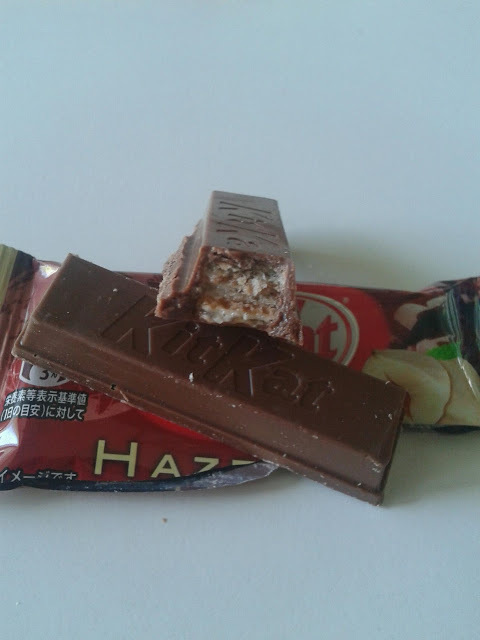 Now the hazelnut bar looked like any regular chocolate kit kat bar, but the layers had a hint of that hazelnut chocolate to it. I wasn't that impressed with this flavor, mainly because I expected a stronger hazelnut flavor, like maybe that of Nutella. 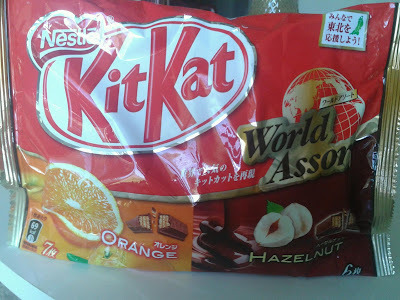 Overall, I never regret buying these World Assort kit kat bags, since its a fun way to share and enjoy more than one flavor. They also make great gifts (but don't leave them anywhere warms since they will melt, and melt quick!) I bought my bag for around $6 which is the usual price (at your local Japanese grocery store anyway) for these bagged kit kats.